On the backs of the cards, you show a stick figure magician, and explain that he's going to reveal the chosen card. Riffling the deck like a flipbook, the stick figure eats a taco supreme (with extra hot sauce! ), which doesn't seem to agree with him too well. 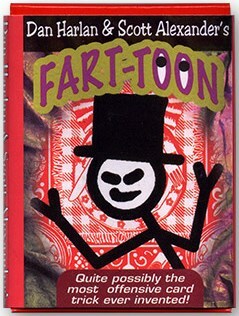 The stick figure emits a gaseous cloud from his rear end, with the selected card revealed among the toxic fumes! From the minds of Dan Harlan, creator of the original Card-Toon, and Dan Alexander.